Senate hearings on Supreme Court nominee Brett Kavanaugh are set to begin on Tuesday. For upcoming events, see accuracy.org/calendar. Cohn is professor emerita at Thomas Jefferson School of Law and recently wrote the piece “Kavanaugh Scorns International Law and Loves Executive Power” for Truthout. 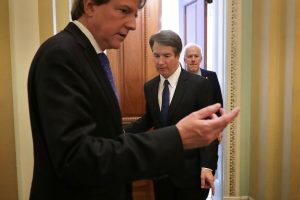 “Kavanaugh would thus create a dangerous presumption in favor of a president who refuses to follow the law. Kavanaugh reportedly played a key role in Bush’s signing statements, in which Bush reserved the right to ignore parts of Congressional statutes with which he didn’t agree. Cohn is former president of the National Lawyers Guild and deputy secretary general of the International Association of Democratic Lawyers.